Yep, this looks like a FromSoftware game alright. As with all of its story trailers, this new ad for Sekiro: Shadows Die Twice is a sombre, blood-soaked affair, showing the player character kneeling, defeated, on a Sengoku period battlefield. It seems as though a warrior takes him under his wing - although not before literally scarring him for life - and transforms him into a highly skilled shinobi in his own right. It's a brief but badass trailer that hints at a more character driven experience this time around. We're very much looking forward to getting our hands on it, and the wait is almost over. 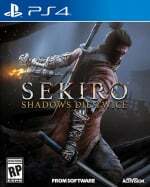 Are you excited for Sekiro? Grab a katana (but not the pointy end) in the comments below. It looks great, day one for me. Holy crap, that looks awesome. Definitely a day one for me, looks bloody brilliant. Wow thats a sharp sword. Barely touched him with it. I have this preordered cant wait. That's looking great, I'm getting excited for this one. Crikey, the old geezers voice sounds like he eats sandpaper for breakfast, lunch and dinner! Badass trailer!!! So excited for this one!